Something slithered in the underbrush. A bobbing shadow pursued it, fast and methodical over duff and scattered twigs. A scaly tail flicked, disappeared under a drift of rotten leaves. The shadow leapt. There was a scuffle, a crunch. “Karl, I got it!” shouted the girl, cheeks flushed red. She shuffled upright, waved her fist in the air. A sinuous something writhed in her clenched, muddy paw. A boy, dressed in hunter’s flannel, scampered to meet her. He skidded on the leaves, bent close. He marveled, agog, at the black and scaly creature coiled about her wrist. “Wow” he said, stared at the head, pinched just below the skull by the girl’s thumb and dirty forefinger. Tiny, needle teeth snapped audibly, ineffectually. Minuscule ribbons of smoke rose from pinprick nostrils. Two domed eyes glittered, still. “Quick, Karl, get the jar” said the girl, panting. Karl fumbled for a jam jar tied at his belt with string. He also produced a pair of wooden tongs, lifted both to the wriggling form. “Karl! Heike!” sounded a deep voice, not far off. Heike startled, went redder. Karl hid the implements behind his back. Heavy boots crunched. A shadow fell over the children. A hefty mustache crinkled in disgust. “You put that devil down, right now” boomed the man. Sheepish, Heike averted her gaze. “Yes, father.” She let go, shook the thing free of her wrist. She stepped back hurriedly. The children scurried off. They put their heads together, conspired. “We’ll find another” said Heike. “I heard whisperings under the old barn. There’s bound to be lots.” Karl nodded. They grinned. The children traipsed off into the autumn wood, again in search of a serpent. There was a squawk in the night. Hulde popped a wrinkled eyelid, listened. Out the frosted window, a commotion of flapping and delirious birds disturbed the night. Hulde cursed, dragged herself from bed. She stuffed thin feet into rabbit-lined boots, wrapped her nightgown tight. The white old nan plucked a candlestick from her bedside, lit the taper. She seized a hefty skillet from the dying fire’s grate, shuffled to the cottage door. Sharp flakes of snow slipped around the frame, bit at her bare and veiny ankles. Some fifty feet from the cottage, under a drear old fir, stood the henhouse. A wretched din rose from therein. Hulde made haste to the little hut, then stopped, startled. The hut had shuddered, bounced on its foundation. Clotted snow dropped from the eaves. A puff of sour smoke rose from the torn-away door. A shrill, avian voice went up, silenced. Hulde gripped the chilly skillet, marched with greater vigor. As the old women grew near, her candlelight showed weird, clawed prints about the henhouse: Long-toed marks, far larger than a fox’s. Splintery rows of rents showed about the wooden doorframe, deep as a chisel’s cut. At that moment, a pair of battered hens fell into the snow, limped away, tittering. Another, its tail aflame, followed, screaming. With careful steps, Hulde rounded the doorframe. She raised the skillet, lifted her candle for the light. The yellow flame panned over a mess of carnage. Scattered, burned feathers and red droplets stuck to broken nesting boxes. Still, stained lumps of birds lay amid hay and debris. In a shadowed corner, something coiled. A wet crack of bone accompanied the jerk of a sinuous, scaly neck. Long, hard-lipped teeth flashed, smeared red. Slits of eyes shon flat and hungry in the candlelight. The triangular head jerked again, lifted from a macerated chicken. Feathers and greasy smoke floated from the snout. Furious, Hulde hefted her skillet. “Out, out!” She threw it. There was a hollow thump, a clang. The long shadow jerked, uncoiled, turned to the woman. It hissed. Cherry embers glittered in its many-toothed throat. Sparks spewed through hooked fangs. Hulde gasped, backpedaled. Her candlestick fell, lodged in the snow. The old woman fled into the night, heels licked by serpent’s flames. Grey faces loomed from the walls. Lamplight slid through their carven, empty pits of eyes. Tiny beetles fled from the sockets, slid down granite cheeks like onyx tears. “Duane” exclaimed Piedmont, turning his lantern. “Look at these beetles. Some sort of Polyphaga. Do you know what that means?” The scholar looked expectantly at his partner. A mess of curly locks stuck to his sweated brow, obscured an eye. He looked quite mad. “Like what?” said Piedmont, holding his lamp close to the faces. He mimicked their dour expressions, idly. Cracked tiles had fallen from the ceiling, leaving nothing but a gap between canted beams of stone. From that gap, a trickle of beetles fell. Piedmont held his lantern to it. He grinned madly. Pressing through the gap was a black wall of scaly flesh. A rent, purple with rot, showed in the hide. Deep in that slowly heaving wound glimmered a glow like molten steel. Every wriggling worm has a flame in its belly. The smallest, starving slip of scales may grow great as the fire serpents of old. Every serpent starts the same: A dumb, bare line of scale and sinew made ambitious by incredible hunger. These scraps dine on beetles and baby voles, determined to feed the smolder in their long guts. Such puny serpents are nothing. They die in droves, seized by hawks or crushed by gardener's trowels. * Only the lucky ones have a drop of poison in their fangs. Within a week of hatching, even the lucky ones are reduced to naught but a puff of smoke and a smear of spite. Great fires are not built without kindling, though. With sufficient time and infant rodents, a truly fortunate serpent will grow in both size and wit. These hunters possess a glimmer of cunning and predatory intellect. They climb, trailing smoke, into the nests of birds and rabbits, eat the young in their sleep. Soon, they establish a territorial range, settle into an existence devoted to mere hunger. After many years of gorging, a serpent changes. Its internal flame kindles, grows vital and deadly. No more will the beast lounge, vulnerable and fat, after stalking and swallowing prey whole. Instead, it begins to hunt and dine like the panther: With speed, cunning, and bone-breaking jaws. The developed serpent asserts dominance over an every-expanding domain. Mice, fleeces, foxes, small dogs; all become easy prey. Anything that may be killed is slaughtered, dragged into a lair, and devoured. All feed the serpent's growth. Further growth becomes curious. A serpent's long, sinuous body buds girdles for new limbs. ** The beginnings of wings or clawed haunches show on muscular stumps, grow with every feeding. Eventually, the monster is gifted with new means of locomotion and violence. It learns to hunt in the sky or deep water. Most chiefly, it learns to wield an ever-growing command of flame. With a bit of fire, larger meals become available. *** Deer become simple kills. Small bears, boar: Tempting. Other apex predators: Burned and gobbled down in chunks. Greater prey exists, though. 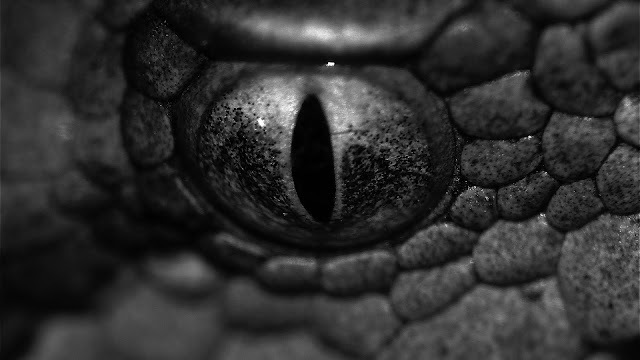 Humans, present and feared since the serpent's small birth, become a particular desire.† A taste of them sparks something within the burgeoning mind. Not a raw, crude hunger, like before, but a more nuanced and sadistic fascination. A serpent, so intrigued, begins a new sort of predation. It will pluck lone travelers from the road, listen to their pleading and cursing with bright intent. It will slither down chimneys in the night, watch babies wail ugly in their cribs. It will curl in the rafters of churchhouses, listen to tales of Aveth and Sir Brecht the Serpent-slayer. It will form, in time, a hatred of Litorans, and a desire for what they call their own. 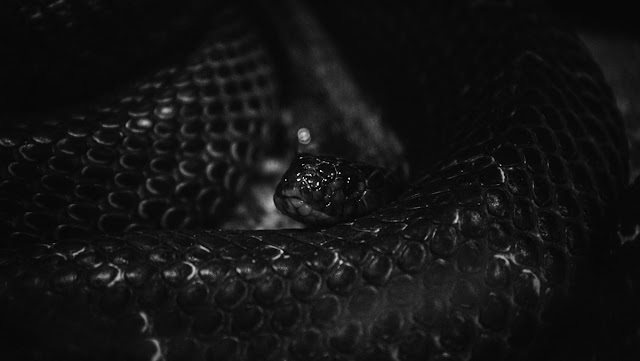 These, known as dire serpents,†† lead dark and misanthropic lives. They take up in caves or old towers, which they fill with the collected wealth and bones of years of human predation. They steal books, turn pages with flickering tongues. They capture artists, bid them to create, lest they be burned. They steal the pretty sons and daughters of royalty, if only to make them sing. Eventually, even dire serpents meet an end. After decades of effective ravishment and abuse, populations are apt to drive out a tyrannical beast. A Knight††† will be summoned by some king mourning his burned princess, drive a lance through the serpent's furnace heart. If a serpent is clever or lucky, it will survive a concerned attempt to slay it, flee to more protected lands. Most are not so fortunate. They die by their own incautious hate. It is a serpent's own, weird misanthropy which leads it to doom. The wisest old worms know to temper their aggressions, lead long and ponderous lives. Many flee to the sea,‡ where Litorans fear to stray. Others delve deep into mountain caves, enjoy hidden lives. Others creep into the abstruse reaches of Otherworldly woods, find ælves to keep as company. Only the wisest grow immense in both mind and scaly form. These, known as antique serpents, live for uncounted centuries. Their gigantic, armored forms are nigh-unbreakable. Their fires, like molten steel, heave in guts like blast furnaces. Their minds, immeasurable, churn behind vast, unblinking eyes. Antique serpents are a legendary breed. It is these huge and intelligent monsters who raised armies a thousand years and more ago, against whom the Lord Aveth prevailed and freed young Humanity. Now, such serpents exist only in rumor and myth. Where they hide today, few know. None would deign to proclaim the extinction of serpents, though. Such a statement would be ridiculous. Serpents are everywhere. They're in the underbrush, in the tomato patch, in the old garden shed. They are wriggling sparks, each with the potential to blaze. There's much more to be written, on serpents (the least of which concerns their life cycle in relation to adventuring encounters.) That's for another day. * To Litorans, it's established habit to crush or otherwise execute a serpent, if seen. Folklore instills this habit at a young age. ** The combination of limbs a serpent receives may be somewhat random (it also depends on species, but species of serpent are ill-defined.) Wings, be they for flight or swimming, are the most common attribute. *** A usual serpentine tactic involves the lighting of calculated forest blazes, which are used to drive herds to their deaths. Such a mass of kills may lead to a considerable jump in a serpent's growth. 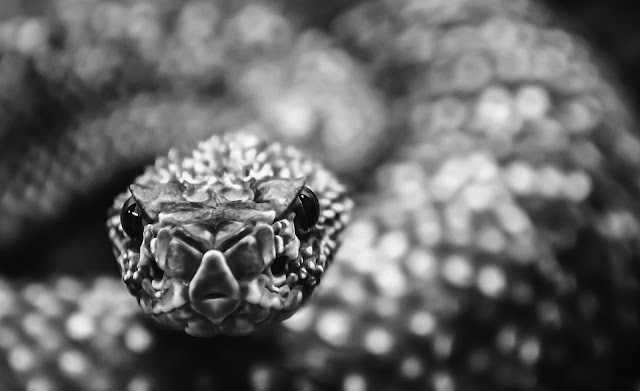 † Serpents become confident in interacting with humans once they match the average man in size and strength. A winged serpent of this size is more than capable of seizing people like a hawk does prey. †† It is at this age that serpents lay eggs. They have no need for a mate. Each egg gives birth to a thousand scrawny neonates. Serpent dens are usually crawling with young, both dead and alive. Older serpents will not hesitate to devour their own offspring. ††† Or a pack of cutters. ‡ Thus, we have very real tales of coiling, smoking serpents on the high sea.